Since 1995 Repsol has been the title sponsor of the factory Honda MotoGP team and after 20 years of sporting success and technological development, a new three year agreement will see Honda and Repsol continue their special partnership through to the end of 2017. This is the longest running sponsor-factory agreement of its kind in the history of the motorcycle World Championship, and has converted the Repsol Honda bikes into icons within the motorsport world. Reigning World Champion, Marc Marquez, together with teammate and Honda stalwart Dani Pedrosa, will continue to represent these two prestigious brands as the factory riders. The collaboration – which this year celebrates its 20th Anniversary – began in February of 1995 providing a perfect combination between bike, fuel and lubricant that has brought sporting success and technological development. Over these 20 years, the team has taken 10 rider titles, 133 victories, with Mick Doohan’s 35 and Dani Pedrosa’s 25 of particular note. Added to this are 354 podiums, 137 pole positions and 152 fastest race laps*. The Repsol Honda team has also been team champions on 6 occasions, since the award was created in 2002. 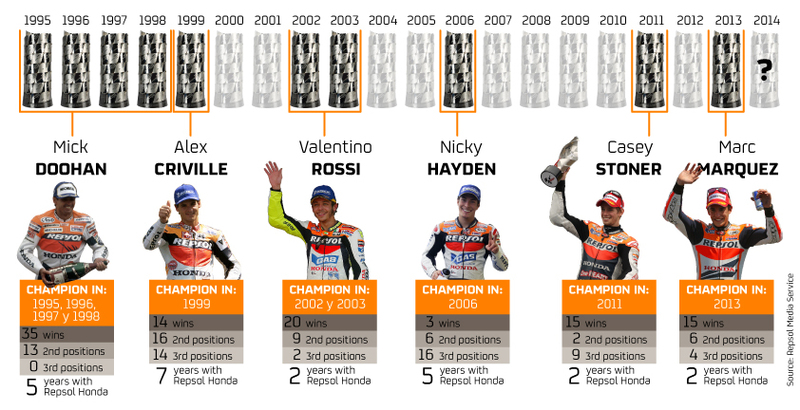 Half of the World Championship titles won in the past 20 years have gone to Repsol Honda thanks to Mick Doohan (between 1995 and 1998), Alex Criville (1999), Valentino Rossi (2002 and 2003), Nicky Hayden (2006), Casey Stoner (2011) and Marc Marquez (2013). The bond between Repsol and Honda goes beyond a conventional sporting sponsorship arrangement and is solidified with the relationship between the Honda laboratories in Saitama, Japan, and the Repsol Technology Centre in Mostoles, Spain. In the 1990s, the collaboration began with the development for 2-stroke engines later moving on to the challenge of developing for 4-strokes. At the Repsol Technology Centre, studies take place with a unique single cylinder engine prototype identical to those used in Marc and Dani’s bikes – only Honda’s engineers in Saitama share such investigations with a unique single cylinder engine. This year, MotoGP fuel tanks house one litre less than in 2013 (a reduction from 21L to 20L per race), making efficiency a challenge.